I commonly see hypothyroidism and the need for thyroid hormone replacement in my patient population. Our body’s hormonal symphony requires balanced thyroid hormones. The thyroid gland, a butterfly-shaped hormone at the base of the neck, builds these hormones. This gland responds to stimulation from the hypothalamus and pituitary glands, which are located in the center of the brain. We all know of the thyroid-related pituitary hormone TSH. This is short for Thyroid Stimulating Hormone. Under the influence of TSH from the pituitary, the thyroid gland begins to assemble thyroid hormone. Thyroid is built upon the amino acid tyrosine. Enzymes in the thyroid gland then add four iodine molecules. The bloodstream circulates thyroid hormone throughout the body. Every cell has a receptor for thyroid hormone, so it is pretty important for all of our organs and tissues. You may be familiar with the hormone T4. This is shorthand for the tyrosine molecule (T) with four iodine molecules attached. T3 has a similar arrangement, but with three iodine molecules. Reverse T3 is the mirror image of T3. It lacks a different iodine molecule from T3, and inhibits the activity of the thyroid receptor. In general, it is thought that the T4 has little to no biologic activity. The vast majority of thyroid hormone activity is through T3, the active form. I review the biologic and clinical effects of thyroid hormone here. Reverse T3 (RT3) is the doppelganger of its mirror image T3. It is T3’s evil twin; it is the Jekyll to the T3 Hyde. When the body is healthy, the T4 converts to its active form, T3. Optimal levels of T3 allow the body’s metabolism to churn along nicely. In time of stress, inflammation, or starvation T4 converts to RT3. With higher levels of RT3, our body goes into hibernation mode. The purpose of this post is to offer some practical strategies to help you to work alongside your doctor to correctly manage this critical hormone. To understand optimal thyroid replacement, we will first need to review the concept of a negative feedback loop. Our body utilizes negative feedback in several systems. Thyroid function and feedback explain this most clearly. This relationship is maintained through negative feedback, which we will cover later in this blog. 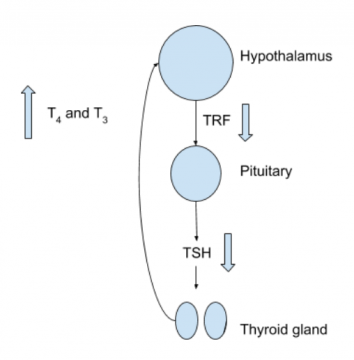 Hypothyroidism typically presents with low free hormones and an elevated TSH, as shown in the diagram above. Here we see negative feedback in its simplest form. One hormone goes up, the other goes down. In Hashimoto’s Thyroiditis, the thyroid gland is damaged by antibodies and inflammation. Typically patients present with the relationship shown above: low free hormones and an elevated TSH. Scar tissue from the inflammation replaces normal thyroid tissue. A scarred thyroid gland generally isn’t able to make enough thyroid hormone. Individuals with this condition may need thyroid hormone replacement for the rest of their lives. For this reason it is important to measure and replace thyroid hormone correctly. Let’s start with a review of a feedback loop, focusing on the one that involves the hypothalamus, pituitary and thyroid glands. Several hormonal systems in the body utilize this feedback. Today we will just focus on the thyroid. By studying this negative-feedback loop, you will understand what all those numbers mean on your thyroid hormone testing. This insight and knowledge will allow you to become a better advocate for your thyroid health. The principle is simple. But first, let’s define a hormone. A hormone is a molecule that carries a biochemical signal from one part of the body to another. That’s it. This signal tells the recipient organ, muscle or gland how to work. The brain sends a signal (via a hormone or nerve) to a gland instructing it to make its hormone. This increasing hormone production feeds back to the brain. In response to the elevated hormone levels, the brain makes less of the signal. The gland then lowers its production of the hormone. When the brain senses low thyroid hormone, the hypothalamus releases TRF, Thyrotropin Releasing Factor. TRF travels down a short stalk to the pituitary gland, which sits just below the hypothalamus. 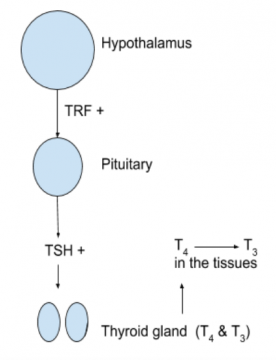 Stimulated by TRF, the pituitary then sends TSH to the thyroid gland. The TSH programs the cells in the thyroid to make more T4 and T3. The majority of the hormone made in the thyroid gland is T4. A small amount is T3. In the tissues, an iodine molecule is then removed from the T4 to make the active thyroid hormone, T3. Increased production of the thyroid hormones T4 and T3 feeds back to the hypothalamus. As the hormone levels rise, the hypothalamus decreases the production of TRF. The downstream TSH decreases as well. Here we see negative feedback at work. The diagram above shows how the higher levels of thyroid free hormones then inhibit the hypothalamus. With increasing amounts of free hormones the TSH decreases through negative feedback. An extremely low or suppressed TSH is most apparent in Graves’ disease, which is a hyperthyroid state. Unlike Hashimoto’s, which over time destroys the gland, Graves’ disease produces antibodies that overstimulate the thyroid gland. In the presence of these stimulatory auto-antibodies, the thyroid makes high levels of thyroid hormone. In Graves’, the high level of thyroid hormone is not made in response to signals received from the brain. One of the first laboratory signs of Graves’ is a suppressed TSH. The brain senses that there is too much hormone around, and knows not to send signals to the thyroid gland to make even more hormone. The pituitary gland stops making TSH. The Relationship in Graves’ looks like this. The primary question to ask your doctor is whether he or she believes that you should be following only the TSH, or the TSH in addition to the free hormones (T3 and T4). Knowing only the TSH does not show how much thyroid hormone is being seen by the target cells. I clearly recall a lecture from a thyroid “expert” while I was in medical school. He said, and I quote. We are taught to this day in medical school that a “full” thyroid assessment can be made with only the TSH. With more than two decades of clinical practice under my belt, I can tell you that this lesson couldn’t have been more wrong. In my patient population, I follow TSH in addition to T3 and T4. For years I have seen that TSH alone does not correlate with the patient’s clinical symptoms. I frequently see patients with a “normal” TSH whose free hormones are horribly low. Usually these patients have thyroid-related symptoms. If you never stop to look for something, rest assured that you will never find it. This particularly applies in thyroid hormone management. This is a good starting point, but not a good ending point. 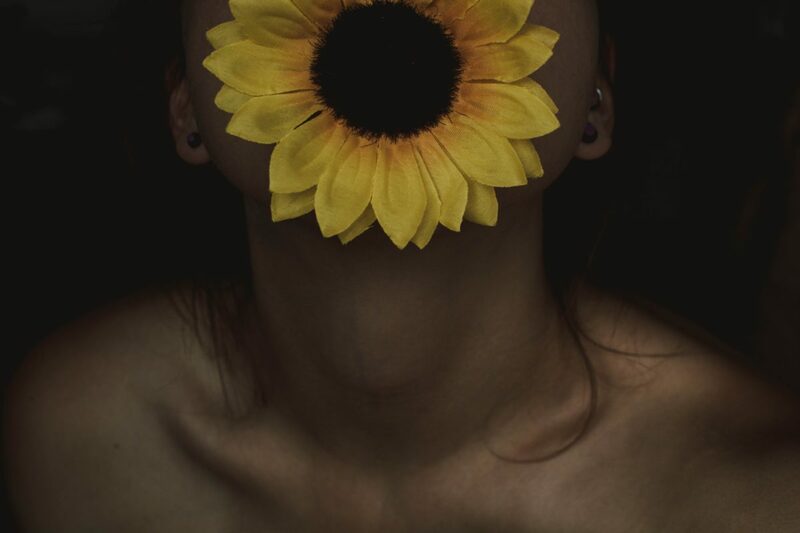 If you have absolutely no thyroid symptoms, and a TSH that is between .5 and 1.5, you probably have normal thyroid function. But that’s not the typical person in my medical practice. And that probably is not you, if you are reading this blog. A TSH greater than 4 is always abnormal, and is frequently associated with Hashimoto’s antibodies. Second: Add Free T3 and Free T4. Do not settle for any other measurements of thyroid function. These free hormones represent the level of thyroid hormone seen at the level of the cells. Many doctors contract with labs that offer “panels” with markers such as total T4, Free Thyroxine Index and T3 uptake. Don’t settle for these tests. They will not give you a complete picture of your thyroid health. Third: Consider measuring Reverse T3. I tend to add on this lab test on occasion, but not with everybody. A person who has persistent thyroid symptoms, and a “normal” TSH or T4 on Levothyroxine or Synthroid (prescription T4). In this case, a well-intended physician may be continually upping the dose of the prescription T4. The higher T4 suppresses the TSH, but the T4 may be converting to the “evil twin” RT3 and not the active thyroid hormone, T3. A person who has recently undergone significant stressors, weight changes (up or down), or is inflamed. RT3 is our survival hormone. It lowers our metabolism. Fad diets and unending stress tell our body retreat to survival mode. Our body does this to save energy, preserve our resources and stay alive. Fourth: Look for autoimmunity. Consider Hashimoto’s and Graves’ disease. These two autoimmune conditions are generally on different ends of the thyroid spectrum. In Graves the TSH is suppressed and I will commonly see a low TSH <.01. The antibodies are independently driving the thyroid gland. The thyroid stops listening to the pituitary. It is marching to a different drum, that of abnormal antibodies, rather than the normal signals sent from the brain. Hashimoto’s Thyroiditis can present with both a hyper and hypothyroid state. Patients almost always present in a hypothyroid state with a high or high normal TSH, and low free hormones. Hashimoto’s is similarly an antibody-driven autoimmune condition. But in this case the antibodies attack and destroy our own thyroid gland. Our body basically attacks itself. Early in the condition, Hashimoto’s can look like Grave’s disease as the inflammation actively progresses. Inflammation initially turns the thyroid gland on, and thyroid hormone spills out as the gland is damaged. Over time the gland burns out. Scar tissue replaces normal thyroid cells. It seems like this is when the vast majority of Hashimoto’s patients present to the doctor. Their fatigue, and progressive low thyroid hormone levels have become too prominent. Hashimoto’s is frequently missed in the early stages of the disease. I have seen numerous patients with early Hashimoto’s presenting with a TSH of 3.5-4.5, and hormones in the “normal” range. The individual with early Hashimoto’s often unnecessarily suffers with fatigue for years before the condition is discovered. In conclusion, you will need to check labs to fully evaluate the function of the thyroid gland. Be sure to measure the TSH in addition to the free hormones. Additionally, consider looking for evidence of autoimmunity with a strong family history, and either a very high or very low TSH on initial laboratory screening. If your doctor insists on only checking a TSH, look into direct-to-consumer testing on the Internet to better understand your thyroid function with the testing listed above. In a subsequent post, I will review how I like to actually replace thyroid hormone. You can use these tips to work with your doctor to get your thyroid function, your energy, and your health spot on. Scott! Thank you so much for posting your Thyroid 101. I’ve skimmed through it just now and realize I need this information for improving my care of patients. 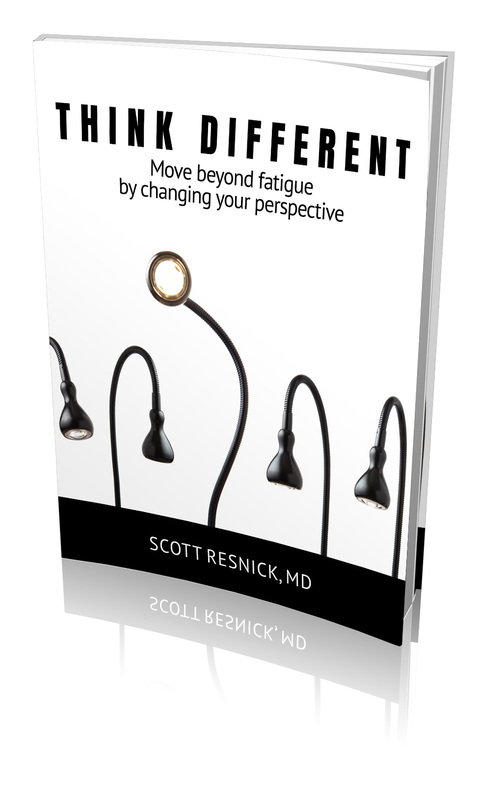 It’s super helpful and my practice has just now changed when it comes to all the women with complaints of fatigue. I hear it every day. I appreciate you sharing your knowledge. I’m excited to apply it, starting now, and having more success in helping female patients get appropriately diagnosed, and treated. Thanks Scott! Sandy, Thanks for the note. I am publishing “Part II” later today; this will mirror the first half. I am so glad that this is helping your clinical practice. You made my day! All of this seems so confusing. However, Dr. Resnick has a great way of explaining all of this in his office. It especially makes sense when he is talking about your own results. I’ve felt bad for the past four years. I’ve put all of my trust in him to get to the bottom of my problems and make me feel better. One of the things I most admire about Dr. Resnick is he tries to find the cause of the problem. Most physicians just ask you what’s wrong and get their pad out to write a prescription. Not Dr. Resnick. I love the fact that he gets excited about talking to me about my health. I’m on my way to feeling better thanks to Dr. Resnick and his staff. Thanks you for your comment. We really do our best here to help people to get well. I’m posting a follow up to this blog sometime today, so be sure to check it out. Next Post: Snap! For a Healthy New Year!